Jacques Henri Lartigue chronicled the gauzy, gay world of upper-class France in the early 1900’s. THE MOST APPEALING FEATURE OF EVERY NEW ART is that, for a while, everyone participating in it is an amateur. Because a new art has no history, it has no history-makers….no professionals, no celebrated artistes, no one who is doing it better. Everyone is, briefly, in the same “how-do-you-work-this-thing?” boat. His name was Jacques Henri Lartigue, and, whatever else formed his strong visual sense, it certainly wasn’t the nobility of poverty, born, as he was, in 1894 in France to upper-class wealth and the privilege that went with it. His photographic muse thus contained none of those inspiring Lean, Hungry Years or Hard-won Real World Experiences that we associate with mature art; the kid was just born with an instinctually strong knack for composition, and what he chose to compose just happened to be the activities of the Rich and Famous….in other words, everyone he hung out with. Lartigue’s social set were the racers and aviators of the sleek new century. 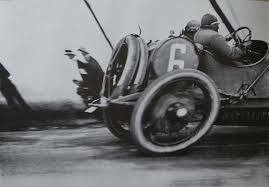 Lartigue’s social set was the class every other social set in France aspired to; the people who seasoned at the Rive Gauche, the people who competed in lawn tennis tournaments, the country’s first race car drivers and aviators. Armed with a simple gift camera, and taught processing by his father, Jacques began snapping the world around him at age seven, maintaining journals that contextualized the images, bookmarking his family’s gilded role in the newborn twentieth century. Gifted with an eye for photographic narrative, Lartigue nevertheless segued into painting, where he spent virtually his entire adult life. In fact, it was not until a friend showed some of Jacques’ photos to John Szarkowski, director of photography at the New York Museum of Modern Art, that Lartigue had his first formal photographic exhibition, in 1963, when he was sixty-nine.The show led to international recognition of his untutored yet undeniable talent, as well as a few prize portrait commissions and a second social career with the same elite one-percenters with whom he had rubbed elbows as a boy. One of his final collections, Diary Of A Century, was published in cooperation with Richard Avedon in 1978. He died a late-blooming “overnight success” at ninety-two. What began for Jacques Henri Lartigue as family snapshots became one of the most important chronicles of a vanished world, and thus the best kind of photojournalism (or sociology, depending on your college major). For shooters, this boy of privilege remains the romantic ideal of the talented amateur. This entry was posted on January 4, 2017 by Michael Perkins. It was filed under Commentary, History, Photo-journalism and was tagged with Lartigue, MOMA, photographic history.